The Articles of Agreement is a contract between the ship and the crew, outlining appropriate behavior, wages, length of voyage, and food provided to the crew. This is from the Articles of Agreement, August 4, 1874, Ship Frank N.Thayer. This shows the minimum required food allotment per person per day. 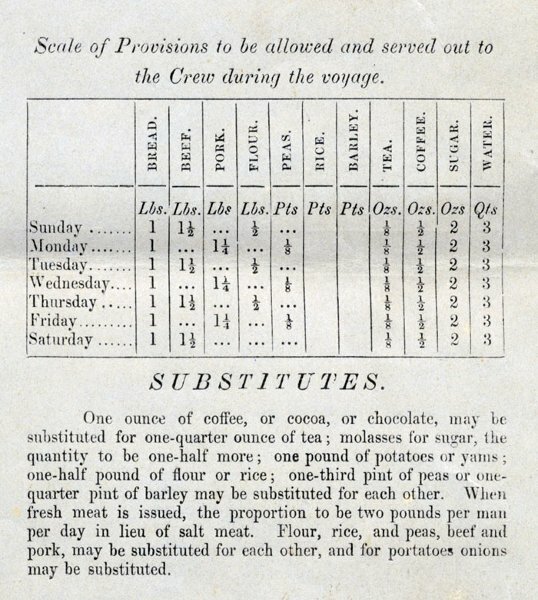 Typically, food aboard U.S. sailing vessels was better than it was on British ships, but there were limits as to how much variation seamen experienced in their eating. The diet had plenty of calories but any variation was up to the skills of the cook. Part of this was due to the need to carry provisions that would not spoil. While canned food was available and expensive, frozen food would be 75 years in the future.